By completing the tutorial mission, you have proven yourself as an officer of Starfleet. You have completed all the missions in the Enterprise era. You have completed all the missions in the Original Series era. You have completed the single player campaign on Ensign difficulty. You have completed the single player campaign on "Captain" difficulty. You have completed the single player campaign on "Admiral" difficulty. You completed the Enterprise era without losing a single ship. You completed the Original Series era without losing a single ship. You completed the Next Generation era without losing a single ship. All of the medical ships in "Be My Shepherd" survived. You kept the spore tally in "Poisoned Well" under 1000. You disabled at least 12 ships in "Stirring the Hive". You captured the Bird-Of-Prey without the help of any captured starbases. You captured all starbases in "The Squeeze". You completed "The Squeeze" without destroying a single ship. You completed "Behind Enemy Lines" without being hit by enemy fire. You completed "Behind Enemy Lines" without cloaking like a lowly Targ. You rescued the Proxima during "FireStorm". You completed all objectives in "FireStorm". All of the allied fleet survived the "At the Gates" mission. You destroyed the Borg abomination in "Omega" without neutralizing its support spheres. You protected the sensor relays from harm in "Revelations". You stealthily completed "Ambush" without destroying any enemy warships. You destroyed a Borg cube during "Anger and Mercy". You saved all the refugee ships in "Anger and Mercy". You completed "Generals" with at least one Klingon and one Romulan ship alive. You completed "Logical Conclusions" without using the repair ship. You delivered the killing blow to more than one ship with a single torpedo. 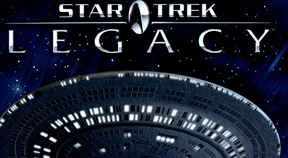 You unlocked the USS Legacy, pride of the Mad Doc fleet! You won your first battle against opponents. You defeated 10 filthy Klingon vessels in a single online match. You destroyed 10 Romulan ships in one online battle. You destroyed 10 Borg ships in one online battle. You destroyed 10 Federation ships in one online battle. You have no name. You wear red. You're expendable.